Here at the Sweat and Butter Journal, I write on topics about which I'm asked most commonly by our health coaching clients and workshop attendees, and oils top the list. Understanding the nature of oils as they pertain to human health requires an understanding of "inflammation", a buzz word that can take on a wide range of meaning. For our purposes, I will review the dangers of inflammation when it persists in the body as well as how selection of cooking oils/fats can exacerbate it. The primary problem with oil consumption in our nation is that we consume too much omega-6-rich fat and too little omega-3-rich fat. Both types of fatty acids are important to your health, but neither should be consumed in great abundance. The idea ratio of omega-6-to-omega-3 is 2:1, but the actual ratio in the typical Western diet is 20:1. This ratio promotes low-grade, chronic inflammation. Seed and vegetable oils such as canola, safflower, and sunflower are rich in omega-6 fatty acids. Wild-caught fish, walnuts, seaweed, and grass-fed beef are rich in omega-3 fatty acids. Extra virgin olive oil will easily burn even under low heat, thus becoming oxidized and potentially damaging to your health. It's best to drizzle olive oil on food that is already cooked. Keep your olive oil refrigerated in an air-tight container. Cook with unrefined coconut oil, palm oil, or butter or lard produced from grass-fed animals. It's better to eat fish a few times per week than to supplement with high doses of fish oil. If you don't eat fish, I recommend supplementing with a fermented cod liver oil/butter oil blend. Keep this oil in the fridge and in an air-tight container. This story begins at the level of the cell. Each cell in your body is comprised of phospholipids. The structure of a phospholipid permits a bilayer of these compounds to arrange themselves such that the internal environment of the cell remains tightly regulated. These fatty acid tails (blue squiggly lines in the image to the left) help the cell membrane to keep certain things in and other things out. As I mentioned before, the phospholipid bilayer is the gatekeeper. Because your body tissues are regularly under physical stress, it's important that your cells are compressible and flexible. A fragile cell will easily break open, which renders it useless. Fatty acid chains stack neatly together allowing phospholipids to sit very closely together in order to fully enclose the cell, but this neat stacking also tends to make the cell membrane rigid. A rigid cell membrane is fragile, so this is not favorable. Fortunately low-density lipoprotein (LDL) is constantly delivering cholesterol to the cell membranes of every tissue in your body, wedging it between the otherwise perfectly arranged phospholipids. Though it may seem counter-intuitive, cholesterol helps promote fluidity in the cell membrane phospholipid bilayer, and this is important for the health of your cells. Phospholipids are clearly important, but the nature of their structure can also lead to problems. Their fatty acid chains are polyunsaturated fatty acids (PUFAs). This type off fatty acid is great for use in the phospholipid bilayer because, as I've already mentioned, they can stack neatly beside one another, but this structure is also easily oxidized. Oxidation is a chemical reaction whereby the multiple double bonds of PUFAs are broken and rearranged when exposed to oxygen, and these rearranged bonds are at an increased risk of forming free radicals. Free radicals aren't necessarily a big problem in small doses, because our cell membranes are equipped with special enzymes and antioxidants such as Vitamin E to repair damaged ("rearranged") fatty acid chains. If they aren't repaired, free radicals will greedily steal electrons from nearby structures - i.e. DNA, organelles, other phospholipids, proteins, etc. - in order to stabilize themselves, but this theft is damaging. OK. Now, you're probably thinking, how do cooking oils fit into this picture? Moving on. The next chapter in this story will be a little more useful in the kitchen. 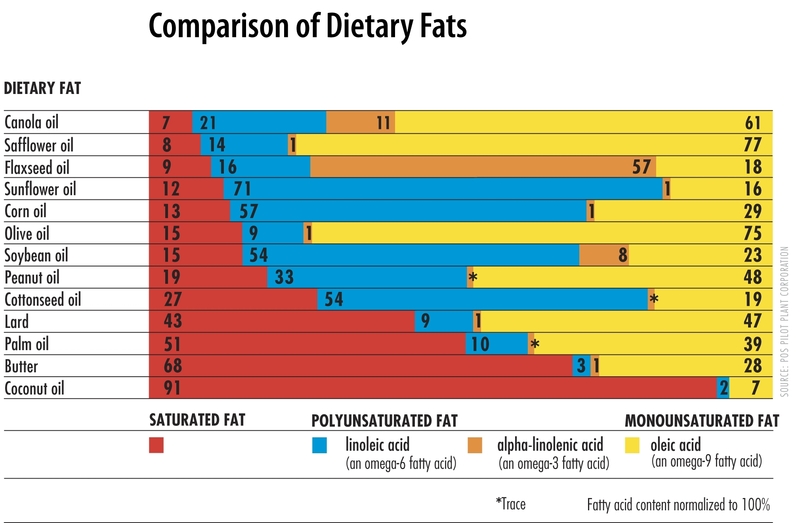 Every cooking oil that you see in the grocery store has a slightly different fatty acid profile. The two major types of fatty acids that we must cover are omega-3 and omega-6 PUFAs. Omega-3s are generally said to be "anti-inflammatory" and omega-6s are generally regarded as "pro-inflammatory". The reason for this takes us back into the biology of the cell membrane. As you can see in the image above, EPA and DHA are intermediates in the omega-3 synthesis pathway. Both of these compounds are readily converted into anti-inflammatory substances. On the other side of the image, arachidonic acid (AA) is an intermediate in the omega-6 synthesis pathway. AA is readily converted into pro-inflammatory compounds. The balance between EPA/DHA versus AA production is the fundamental root of inflammation in the body. If you are producing AA at a higher rate than EPA/DHA, you are inflamed. But what does it mean to be inflamed? We'll get to that a little bit later. For now, just understand that it's no bueno. Until we can talk about inflammation, there are still a few important things to discuss about cooking oils. Depending on its source, an oil will contain different proportions of PUFAs. When you eat omega-6 PUFAs, they are incorporated into the phospholipids that comprise the cell membranes. As you may have already guessed, if you are consuming more omega-6 PUFAs in your diet, you'll be producing more pro-inflammatory compounds via a higher proportion of AA versus EPA/DHA, as your omega-6-rich diet will provide a steady supply of precursors to feed the omega-6 synthesis pathway shown in the image above. When the cell membrane is injured due to free radical damage or trauma, AA is produced and converted into the pro-inflammatory compounds mentioned before, namely LTC4, PGI2, PGE2, and PGF2. Below you'll find a list of common cooking substances and their relative proportions of anti-inflammatory omega-3s and omega-6s. A low-inflammatory diet will have a relatively low proportion of omega-6s. Unfortunately, vegetable oils have been produced cheaply and abundantly since the 1960s, which marked the beginning of the demonization of saturated fats. These oils - canola oil, safflower oil, sunflower oil, soybean oil, and corn oil, as seen in the chart below - are rich in linoleic acid (blue). If you read the labels of most processed foods, you'll see that one or more of these oils have been slipped into the product. Likewise, restaurants use these oils in the majority of their meals because they are so cheap. This has meant bad news for consumers of the Western diet. As I mentioned before, both omega-6s and omega-3s are important for the construction of healthy cell membranes, but the ideal relative proportion is 2:1, omega-6-to-omega3. For the reasons noted, the typical Western dieter is likely consuming a ratio closer to 14:1 or 20:1! This means a greater opportunity for the production of AA and thus pro-inflammatory compounds. I recommend that you minimize use of omega-6-rich oils at the top of the list in favor of butter, ghee, lard, palm oil, and coconut oil. Before we shift the discussion to the dangers of inflammation, I want to make a few comments about extra virgin olive oil (EVOO). This oil has been touted as a superfood for years, as it is consumed in high quantities by healthy populations that live in the vicinity of the Mediterranean Sea. On the chart above, you'll see that olive oil is comparable to safflower oil in fatty acid composition, but extra virgin olive oil tends to be lower in omega-6s than more refined varieties. Having said this, the omega-6 content of EVOO is still higher than the healthier options I mentioned before such as butter or coconut oil, so use it sparingly. Furthermore, EVOO burns easily even at low temperatures, which expedites the oxidation process. As you'll recall from our discussion at the beginning of this article, oxidation is our enemy because it leads to free radical production in the phospholipids of our cell membranes. This free radical formation can trigger the conversion of phospholipid fatty acid tails to AA, which, as you know, easily converts to pro-inflammatory compounds. It's time to come full circle. We know that a diet rich in omega-6s may lead to inflammation, but what exactly is inflammation? When we hear the word inflammation, we normally think of sore joints . After running a marathon, your knees or hips may be sore and inflamed for weeks. This is an example of acute inflammation, which occurs in response to injury. It's easy to know that your knees are inflamed because they hurt and this may limit your mobility. On the other hand, chronic inflammation is probably far less noticeable, which is why it's routinely referred to as "low-grade" inflammation. This is dangerous because, unlike in response to acute inflammation, we don't always address chronic inflammation since it can often burn in the background without producing any dramatic symptoms. After all, if you aren't experiencing any severe pain at the moment, how will you know you need to change your ways? A little stress once in a while can set into motion cellular mechanisms that will make you stronger through a process called "hormesis", but a relentless bombardment of stressors can be destructive. Chronic inflammation can persist for years, and serious disease processes are normally well under way before you change your ways through lifestyle modification. The pro-inflammatory compounds produced from AA in response to free radicals or other damaging trauma to a cell membrane set into motion physiologic mechanisms that help to repair the damage. Evolution at its finest! Prostaglandins and prostacyclins work to dilate blood vessels, allowing blood carrying immune cells to rush to the site of injury. Leukotrienes raise a red flag to mark the site of injury in order to direct the immune cells that are brought to the site by the increase in blood flow. These immune cells, namely neutrophils, go to work on the damaged tissue at the site of injury. If they hang around for along enough, they also start to eat away at healthy tissue, disrupting the physiologic processes that keep us healthy, which is why chronic inflammation has been linked to so many chronic diseases, including cancer, heart disease, diabetes, obesity, and Alzheimer's dementia. To mitigate the inflammatory effects of an omega6-rich diet, you must aim to restore your omega-6-to-omega-3 ratio to 2:1. First of all, reduce your omega-6 consumption by cutting out vegetable oils altogether. Cooking with butter, lard, palm oil, and coconut oil tastes better and is better for you. Likewise, you should increase your consumption of anti-inflammatory, omega-3-rich foods like fatty fish, walnuts, and seaweed. Certain fish are richer in omega-3s than others. Check out the graphic below. Please keep in mind that PUFAs are naturally produced in chloroplasts in the leaves of plants! Fish that feed on algae (or fish that feed on fish that feed on algae) are rich in omega-3s because they feast on wild marine plant-life. Farmed fish, on the other hand, are fattened up with soy products, which are rich in omega-6s. Take care to purchase wild-caught fish. 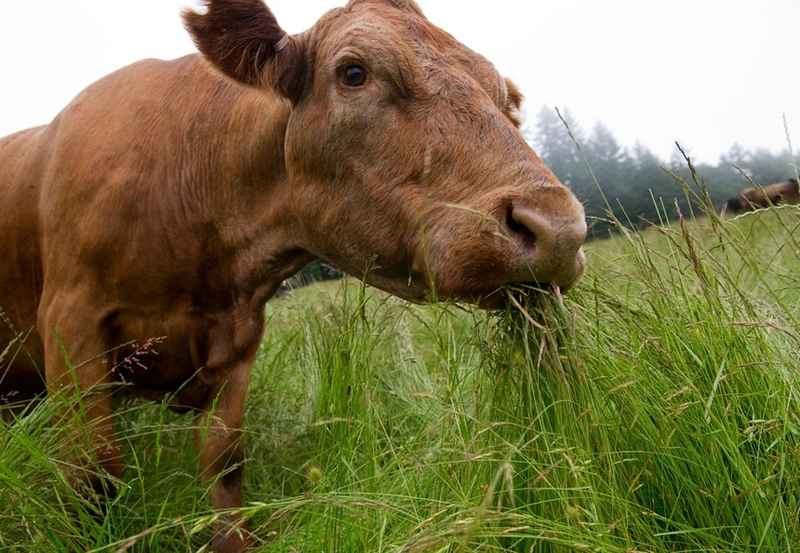 Likewise, cows that spend their lives grazing on healthy, lush grass as nature intended will provide you with a healthier fatty acid composition when compared to cows that are marbled up at a feedlot. Vegetarians and vegans argue that they can consume sufficient omega-3s on their diets. Of course you can obtain a lot of ALA by eating flax seeds and other leafy plants, but our bodies aren't great at converting ALA to EPA and, in particular, DHA. Our herbivorous critter friends help us out by munching plants rich in ALA, converting it into EPA and DHA, then stashing it away in their meaty flesh to the benefit of predators - us. One note about fish oil supplementation. Fish oil is often touted for its anti-inflammatory effects, but all PUFAs - both omega-3s and omega-6s - are at risk of oxidation and thus free radical formation, so consuming large quantities of even "healthy" omega-3-laden fish oil predisposes you to harm. Of all the fats you consume in a day, it's best to keep your PUFA consumption to around 1-3% of your daily caloric intake. If you absolutely won't eat fish, taking just 1000mg (1g) of fish oil daily is sufficient to reap the benefits (although the clinical evidence on the beneficence of fish oil supplementation is a mixed bag). It's thought that Vitamin E will prevent the oxidation of this high-dose PUFA supplementation, though this is also debatable. Better yet, I recommend fermented cod liver oil/butter oil in capsule or liquid form. This formulation provides ample Vitamin D, Vitamin K, Vitamin E, and Vitamin A in addition to sufficient omega-3s. Keep your fish oil refrigerated in an air-tight container, as oxygen exposure increases the likelihood of oxidation. I hope this article helps you to understand the importance of selecting healthy, nourishing oils and fats for use in the kitchen. This guide is incomplete in a lot of ways, but I didn't want to burden you with too many details. I'll leave that to the guys getting their hands dirty in the lab. I'm only the messenger, and, as the messenger, I would be happy to answer any questions you have about the information presented here or to start a discussion if you want to delve even deeper.